R.C. Hedreen began construction earlier this year on the 1,264-room hotel on the block bounded by 8th and 9th avenues and Stewart and Howell streets, next to the planned massive expansion of the Washington State Convention Center. The largest hotel in the Pacific Northwest, under construction now in downtown Seattle, will be a Hyatt Regency when it opens in two years, the hotel chain announced Wednesday. The $400 million, 45-story hotel, one of the biggest projects underway in the city, is set to include 100,000 square feet of meeting and event space, ground-floor retail and a six-level underground parking garage. It will edge out the Seattle Sheraton as the biggest hotel north of San Francisco when it opens in mid-2018. Thearrangement with Hyatt isn’t a huge surprise: Seattle-based R.C. 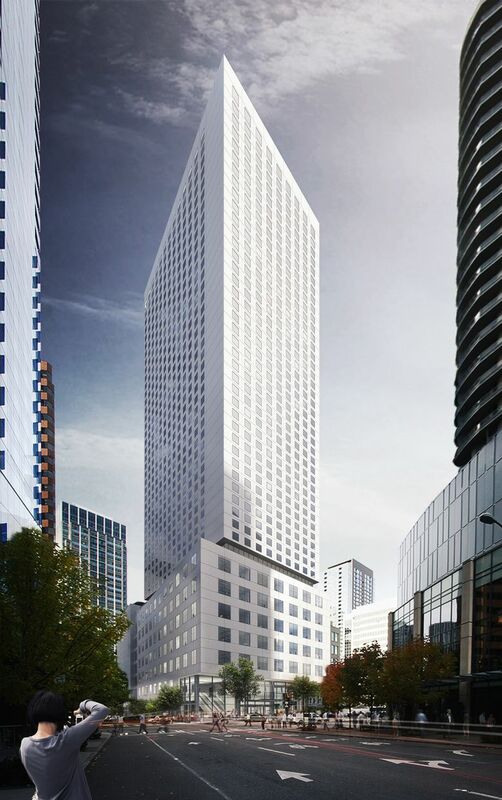 Hedreen already owns the nearby Grand Hyatt Seattle and Hyatt at Olive 8. It’s the city’s fifth Hyatt-branded hotel, but the first Hyatt Regency. The region has two other Hyatt Regency hotels, in Bellevue and Renton. Rates for the new hotel haven’t been released. An advanced booking at the Hyatt Regency in Bellevue costs about $300 a night for a standard room. The project began construction earlier this year without a hotel partner, after the developer won a battle against a local union that threatened to hold up the groundbreaking last year. R.C. Hedreen also had to redraw its plans when the city declined to give it an alley that runs through the site. It’s the biggest of a new hotel wave in the city: Nearly 3,000 rooms are set to open in the next two years in downtown after only 700 new rooms were added in the previous five years.